Dr Marsh was OK but just not very compassionate. She was perfunctory and prescribed medication which is what I wanted butthere was no discussion about what else I could do to help myself or anything very specific about my illness. I was disappointed that she was not more forthcoming about my diagnosis. Dr Marsh was OK but just not very compassionate. She was perfunctory and prescribed medication which is what I wanted but there was no discussion about what else I could doto help myself or anything very specific about my illness. I was disappointed that she was not more forthcoming about my diagnosis. This was my first visit, the stuff’s very friendly, polite and professional, no wait time at all. Dr Marsh was absolutelygreat, very knowledgeable, listened well and just so pleasant overall. This was my first visit, the stuff’s very friendly, polite and professional, no wait time at all. Dr Marsh was absolutely great, very knowledgeable, listened well and just so pleasantoverall. 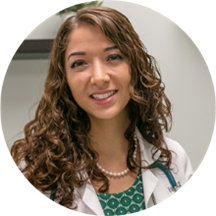 Dr. Vicky Marsh is a talented family physician, practicing at her own private clinic, Bluestar Medical, PA located in Fort Lauderdale, Florida. Dr. Marsh earned her medical degree from Nova Southeastern University and subsequently completed her residency in family medicine at Saint Joseph's Hospital. She is experienced in treating a range of conditions which include high blood pressure, diabetes, high cholesterol, HIV, postpartum depression, post-menopausal bleeding, addiction medicine and medical detoxification from substances. Dr. Marsh communicates with her patients with clarity and ensures they have all the information they need to make the right treatment choices. She is flexible in working with the changing trends in medicine and in the healthcare market. Best appointment ever. No wait at all. Great attitude all around! Love this office. Today was my first visit with Dr. Marsh and her team and it was an excellent experience. Zero wait time to see the doctor this morning and the office is super clean and offers a very relaxing atmosphere. Dr. Marsh ispatient, professional and kind as is her PA, Perry who was more than helpful. This office is also LGBT friendly and I would absolutely recommend to any and all my LGBT family. Very nice people in this office and I have been to many. Glad I made the choice to visit Dr. Marsh! I can’t say enough good things about Dr. Marsh. By far, the best PCP I’ve ever had. Awesome staff, they spent a lot of time with me discussing my needs/concerns. Very thorough and caring! And not a long wait! Dr. Marsh is very friendly and has a great bedside manner. Her office is organized, not to mention spotless, and her staff is great! I would highly recommend Dr. Marsh to anyone looking for a solid PCP. I love professionalism it's important for the doctors to listen and allow the patient to give their input,the nurse was very professional and compassionate so my overall experience was great. Seems every time I go to her office she has the most pleasant staff. There is a Minimum waiti time and Dr Marsh listens and acts on all concerns. Great experience, very nice staff. Dr. Marsh has a great bedside manner! She takes the time to listen to your complaints and then provides a thoughtful recommendation. I would definitely recommend her to anyone looking for a new physician. Really cares about her patients. Knows Family medicine really well- very happy with this doctor ! Great visit, convenient hours, addressed all concerns! Thanks! Very positive experience! Dr. Marsh was extremely helpful and very professional. Dr. Vicky Marsh and her staff are very knowledgeable and I would highly recommend to anyone. I love this doctor and the whole staff. They actually care and take the time with you to answer questions and make you feel comfortable. Can’t say enough great things. Dr. Marsh is very nice. Takes the time and listens to you. Dr. Vicky Marsh Was really good and extreamly patient with any questions I threw at her. She answered them all thoroughly and gave me tips on anything I was questioning. Most definitely would recommend her! Best doctor I have ever dealt with in my life. Truly caring and supportive. Office staff and nurses are amazing and are on top of their job. I really like Dr. Marsh. She's a great listener and incredibly insightful. I highly recommend her! I choose Dr. Marsh based on her reviews here. I have to say, she lived up to those reviews! She was very calming, took her time with me, and asked (and answered) a lot of questions. She addressed all of myconcerns. She was not judgmental in the least, regarding my lifestyle, and offered some helpful suggestions. Her nurse, whose name I forgot, was just as great as the doctor. He was extremely pleasant, and very personable. I'm glad to have finally found a doctor who cares about me as a person and not as stats on a chart. Dr. Marsh was friendly, helpful, and made me feel very comfortable asking the questions I had. I would definitely recommend her. The office feel was very clean and modern. Dr. Marsh was so sweet, patient, and caring. She spent time listening to my concerns and answering all of my questions. I’ve been looking for a primary care doctor and it’s been really difficult to find someone who takes time tolisten and it was nice to finally have a doctor that cared. Dr Marsh was the most understanding kind doctors I have met and her staff was amazing as well! To be blunt, I have a slight fear of doctors. I was searching for a doctor that was patient and polite. I've found her. And the cherry on top is that her nurse, Eddie, is the bee's knees as well. Hetotally calmed me before taking my blood (I was soo anxious!) with small talk and jokes. I think I've found my primary care physician. Great experience. Super nice and very helpful. I would highly recommend will be going back when I am ready for my yearly checkup. She is very kind and caring. She took her time treating me and listening to my questions and concerns. Dr. Marsh is resourceful, intelligent and kind. So is the rest of her staff. I am newer to the area and hadn't chosen a primary care physician yet, but I can definitely say that after my appointment today that I won'tbe going anywhere else. There was a short wait time and the office decor is comforting and peaceful. Very clean. 5 stars. Super nice, very helpful and overall great! Definitely will be back. Dr. Marsh and office manager are amazing healthcare professionals. Their professionalism, knowledge and genuine care make them all-stars. The office is clean, modern and welcoming. I love the personal attention of the staff, and they showunderstanding and pass no judgement. Addiction treatment is a complex process, and Dr. Marsh does an amazing job explaining the different options and treatments. Expanded office hours helps with busy scheduling and they are great at accommodating special appointment requests. Dr. Marsh and her staff are very professional and caring. Highly recommend. Great service, hands on and listens. Would recommend to others. A+ Service! I really liked Dr. Marsh, and she has a great bedside manner. Her office staff is also quite friendly. My only complaint would be a long wait time when nobody else was in the waiting room - it made me wonderwhy i had to wait so long. But i liked her enough that i will be back. The sweetest most knowledgeable nurse that I ever met. From the first second I entered that office nothing short of amazing. All my females can agree getting a pap smear is the most uncomfortable thing ever this was my first great experience. She was really nice, very patient, and took the time to understand what issues I was experiencing. Very helpful and informative. It was only my first appt/consultation but so far, so good. She is great! Listen to everything and gave options and advice! No rushing and gave me all the attention and time I needed! Loved Dr. Marsh. She's so attentive and knowledgeable. Will definitely go back to her!